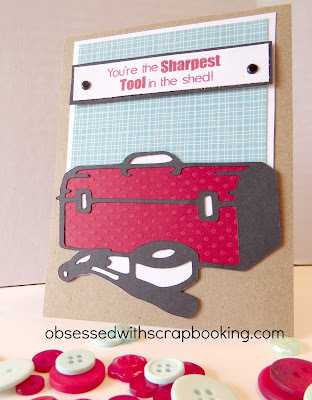 Obsessed with Scrapbooking: Are you the sharpest tool in the shed? Are you the sharpest tool in the shed? Back in my construction management days at Mobil Oil, we had a saying that went "He's not the sharpest tool in the shed..." when referring to a contractor we didn't like. Needless to say, when I saw this saying on the Scrappy Moms "For the Boys" stamp set, I was hooked! The perfect sentiment for the smart men in your life - combine the sentiment with the tool box from the Cricut Father's Day cartridge and it's a match made in heaven. Tool box was cut at 2" - card is 4-1/4" x "5-1/2". I have some more manly cards coming up using this set - isn't it versatile? LOVE IT! 1) Leave a comment below (or by clicking HERE if you are seeing this in email) letting me know if you make a lot of cards for men. I'm trying to get some manly man cards stored up! Click HERE if you don't know how to leave a comment. This post may contain affiliate links that support my diet coke intake, needed to run this blog! Great card! I don't do as many manly cards. They are more difficult. Love the sentiment for this card. I like to make manly cards. I am the mom of 4 boys. I love this card. It looks just like my dad! I always remember when I was little he would say, "Go get my toolbox." Great memories. What a cool card you are truly one talented gal and always find the cool pairs when it comes to stamps and Cricut WOOOO HOOOO for you!!! Such a cute card and saying! I do make several cards for my man, when he travels, I put a card in his suitcase. But they really aren't manly cards, they are "love" cards!! Cute card! We use that statement a lot too...so funny. Such a cute stamp set too! I don't really make that many masculine cards I guess. My husband does not understand my paper craft addiction and fun. So I really only send to my older brother who always acts thrilled;) aren't older brothers the best? Hope everyone has a wonderful day! I love the girly cards, but have mostly men to make cards for, so the more things you come up with, the better for me. I just feel that they are more difficult to do. Thanks. i'm always looking for ideas for masculine cards. this is really cute! LOVE this, Joy! That is the perfect sentiment with this cut! Super cute!!! very cool, love that sentiment with the image!! This is great! I do not make many masculine cards. I find them difficult to make! What a cute card! I like that you are doing masculine cards now - it is helping inspire me to make some of my own. The masculine cards I have made are mostly masculine because of the color choices. Your masculine embellishments are really cool! Not that many men that I make cards for these days but I still like having a few designs for special occasions that call for a masculine cards. Thanks for all your ideas. Cute Father's Day card! Love the sentiment! I actually do make a lot of cards for men ~ my father-in-law, two brothers-in-law, hubby, and two sons. I think I still make more "girl" cards, but seems like there's always one of the guys in my life having a birthday, etc. I do not make a lot of manly cards but I do need some ideas! They just don't come naturally to me--I am better with bows and pink LOL! I love this card! I do make manly cards, but it's always a challenge...I tend to gravitate towards frilly girl cards....I am always looking for ideas to inspire me for the man-cards I need to make. Thanks for sharing this cute card! What a great guy card, love the stamp on it. I have my father's day card made, and it is always a struggle. Love this card! You did a great job on this card. This would be a great card to give to my husband as he's always working on something that requires tools. I usually don't make too many cards for men -- just birthday cards and Father's Day cards. Thanks for the chance to win! This card would be perfect for my husband! I'm so lucky because he can fix just about anything! cute card. We used to say "he's not the sharpest knife in the drawer". Both are great! I don't make nearly enough cards for me, always unsure of the type of image to use unless I know the person really well and their interests. Same with get well cards for guys - I find them difficult too! Thanks for a chance at some goodies! Love this card...always hard to do a male one. What a great giveaway....thanks for giving us the chance to win! I can't say that I make "a lot" of cards for men but, I do make some. I frequently stick with nature /outdoorsy themes for them as the guys in my life all like to camp and such. I just have a few manly birthdays each year and that's about it. I do enjoy creating cards with a masculine bent, though. Love using gears, keys, washers, etc. Thanks so much for the chance to win such a fabulous prize. I don't do a lot of manly cards for myself, but I make cards for Operation Write Home and I try to make a least 35-40 cards for men in each batch I send in. Manly cards, for me, are not the easiest to make. Love that tool box! I do make a lot of cards for men. So many, in fact, that they should be easy for me--but they're not! Thanks for the chance to win these stamps. They would be a big help. Love the card and love the give away as it is a great way to break into making cards for the guys! I would love to give it whirl!! Totally Cute ! love it! I need to get a stamp set like the "For the Boys" set then I would probably make more masculine cards. Super card - and such a fun sentiment to go with the image! I make a fair number of cards for men but more for women and children. I go blank when it comes to masculine cards!! I love the Scrappy Moms set though. That should help give some inspiration, got to get it!!! With a hubby, a dad, a FIL, 2 sons and 2 grandsons, I make a ton of masculine cards and actually prefer those to any other type of cards I make. Thanks for the chance to win. Thanks for the masculine card idea! and for the change to win. Cute stamp set for men. I haven't made many masculine cards. It is difficult for me to come up with ideas! So I am looking forward to your creative ones!! Thanks for the giveaway! I use the Fathers Day cricut cartridge almost exclusively for all my masculine cards - it is so versatile for birthdays, fathers day, anniversary or just because. The sentiments in Scrappy Mom stamp set are perfect for this cartridge too - might have to get me that one! Look forward to seeing some more samples. I just love your card and in answer to your question, I don't make many masculine cards and that is because I just can't seem to come up with any good ideas (now I have one, thanks to you). I've got two terrific men in my life and making cards for them has been challenging indeed! Adorable! Love the stamp set too! I really like your card. Even tho two of my six children are male, ten of my 19 grandchildren are male, and ten of my 18 great-grandchildren are male, I STILL find masculine cards a challenge! Thanks for your ideas. What a wonderful card for any man. TFS. I make a few cards for the men in my life. The hubs, four brothers and father-inlaw. I usally make them pretty basic since I'm sure most of them get recycled EXCEPT for my father-inlaw. I found out a few years ago that he keeps each and every one. He has them all displayed on shelves he hung around his house. What is hard for his is to try and remember which designs I've used or not used. I started keeping a picture of his cards in a special file now to prevent repeats. Wow, the tool box is so clean. I love the sentiment. Thanks for sharing your creativity with us. Just LOVE it! 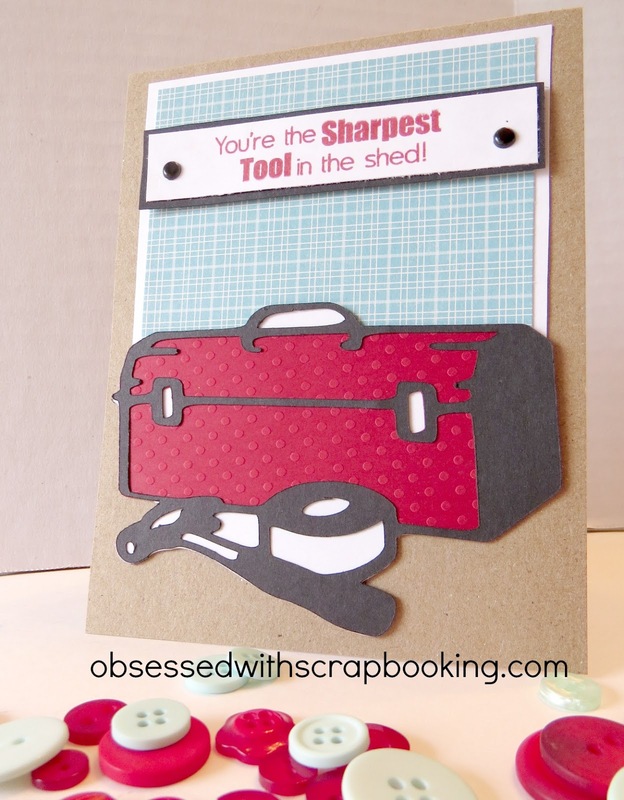 Love the tool box card and the sentiment! 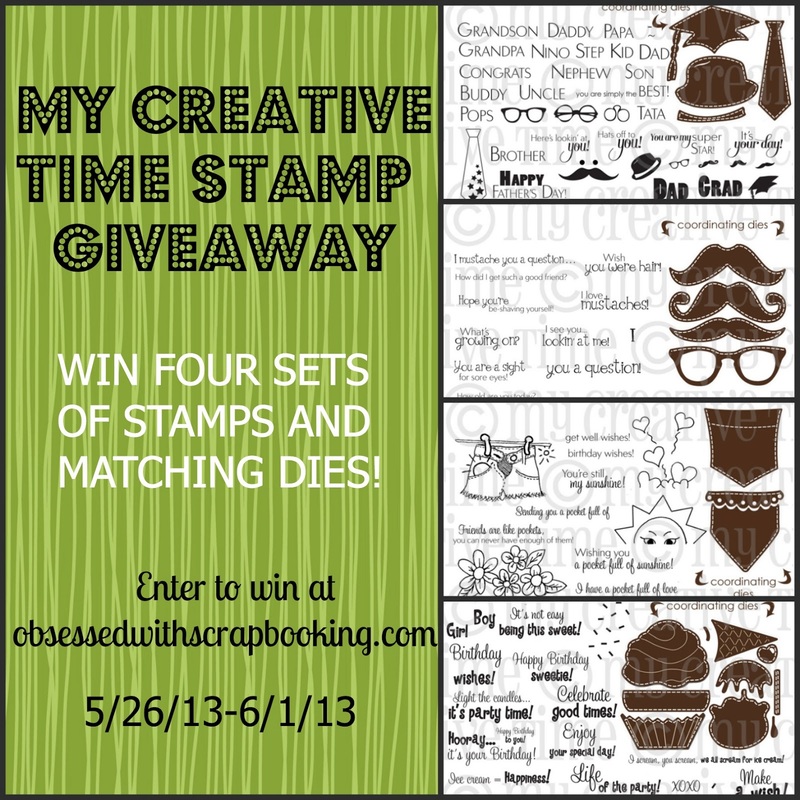 Thanks for the chance to win the MCT stamps--They are so cute! I make several guy cards/boxes and I always struggle with sentiments and ideas. Very cute card! I love your card! I have a really hard time making cards for men. I just never know what to put on them! I actually enjoy making cards for men! You can never go wrong when you us Tim Holtz papers and stamps for them I have found. Such a great card! I should get busy and make one for my hubby!! Great ideas to make masculine cards! What a cool stamp set for masculine cards and layouts! Thanks for the chance to win such a great prize! You really "nailed" it with this card - it's perfect for all my guy friends. I love that card! It is so appropriate for my husband! Thanks for posting it. What a great card. This would be perfect for my dad. TFS. Great card....and stamp set I'd love to make this for my sons and son-in-law in addition to my husband for Father's Day! All are fixer-uppers and the grids "help" as age appropriate....Many times moral support. Cute. I don't make nearly as many 'manly' cards as I need, so need to come up with more options. Thanks for sharing yours! I have a real problem coming up with manly cards. It is so much easier when designing for the ladies! Appreciate you sharing your ideas! Love the tool box! I have made some manly cards. I always appreciate any others' ideas though. I have used cars, lighthouses, camping, outdoor scenes, etc. Thanks for the giveaway too. I took an online His & Hers class recently. It really helped me to see how to masculine-ize cards that look to much like for a female. It was a great class. I have a hard time with masculine cards so I rarely have too many stored up ahead of time. Your card is great. I really like that stamp set. I love your blog! You have so many wonderful ideas and tips .... coupons too! Thank you for taking the time to "blog" for those of us less talented! I am a blog follower ... big time.! Cute card! I am always struggling with masculine cards that are too childish! Thanks for the idea! Great mancard! We don't see enough of them. Such a great idea for a manly card! I generally make cards with birthday cakes or animals on them for men. I just got the Southwest Cartridge and hope to make some manly cards with that. What a great card! I make quite a few cards for guys and I struggle every time! Thanks for sharing! Great Guy card. Thanks for sharing. I really don't make many male cards except for my grandchildren. I would love to have more tools to do manly cards with. I love your website. What a great card! Love the sentiment! Great Man card, love the colors and embossing!! I have lots of men (sons, grandsons) in my life and struggle with each card I make for them, but I always love a challenge, thanks for the chance to win! with fathers day and my husbands birthday coming up i am always on the hunt for man themed crafts to make! Love this card! And stamp set. Cute! This is a terrific sentiment! Love this with the toolbox. No, I don't make a lot of masculine cards, although I need to start...now that my son and nephews are teenagers, cute-sy and generic won't cut it anymore! Thanks for sharing this clever card! Like the tool box card. 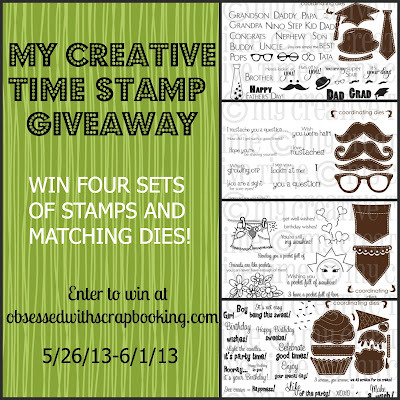 I would love to win some of Emmas stamps. 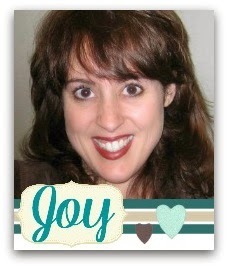 Super card, Joy! I love that Stam set! Can be used so many ways! I am going to have to get that one!! Cute card and stamps! Thanks for the giveaway! You have a great knack for finding just the right stamp to go with your Cricut cuts! Cute card. I love the stamp set. It looks like one I could really get my money's worth out of! I make a lot of cards but not for men. I find it hard and very challenging to make a manly card. Please give us some ideas.Thanks for giving us a chance to win. I do make cards for men in my life, but always have a hard time coming up with ideas. I could use some ideas also. Manly card ideas are difficult. These stamps are amazing. I love the toolbox. I have made a lot of manly cards for my office before I retired in Jan. Mainly I used SU stamps, but have used Cricut Handyman for a toolbox and Wildlife with the deer and bears. I have made fishing, wildlife, computer and car/truck cards. Love this post. I will have to get back to the Dollar Tree for some of those wonderful plastic cups. I bought the heavy beer glasses and etched them for my son-in-law's bachelor party. Etched a wolf, I think from Animal Kingdom and up the guys names and the date of the party. My son-in-law loved them!!! Then put pink vinyled initials on wineglasses for my daughter's bachelorette party!! Love the card! Perfect for daddy in law...he's always out in our shop working on one project or another. Tfs & thanks for the great giveaway! Another "Why Didn't I think of That" moment. Thanks for sharing your ideas and $$ saving ideas. Great card! Men's cards are the toughest for sure! Guy cards are definitely challenging. I make them for my son and husband. Just when I think I don't need that cartridge you post a project that makes me want it! Thanks for the giveaway opportunity and for your wonderful ideas. What a fun card, the sentiment is so perfect. I just love your inspiration! Thankyou. 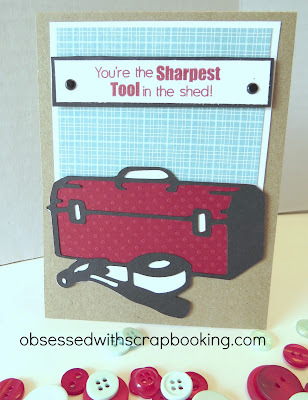 I love,love,love the "Sharpest Tool in the Shed"! Thank you for posting all of these cool manly cards! My hubby is a "Mr. Fix It" dude, and the sayings are perfect! Where can I get them from? Cute stamp set and great card. I don't make too many manly cards but I just got the Outdoor Man cart the other day and will start playing with it soon. I do make a lot of cards for men, but I find those the hardest! I would like to win this set. I'm always trying to come up with some ideas for guy cards and most especially teen boys since I have four teen grandsons. This toolbox card is awesome and the sentiment really made me chuckle. Oh wow, I love this fun card! I have been trying to make more masculine cards lately for Operation Write Home so actually I do have quite a few in my stash. I like to make humorous cards for men because everyone can use a laugh! I am a subscriber already! What a fun card. It is perfect for Father's Day. Thanks for a chance to win. Super cute card! I'm familiar with the opposite expression and love how you turned it into a compliment! I am always looking for good card designs for men and boys because I have trouble with them. I actually have quite a few masculine cards to make every year so you would think I'd be better at it. Oh yes, and I am already a subscriber! Great. Card! It's a keeper. Cute card!! Funny, we would use that same saying when we happened to meet or know someone that was not so smart!! Love the card! Very creative! Super cute bag! You must've been on go-go-gadget mode, because I don't think I could've gotten that done! Thank you for sharing all those fun $1 Dollar store finds. I would love to learn how to use Vinyl,goodness the possibilities!! I still feel like a newbie/beginner with my Cricut Machine skills. Your blog totally rocks, I enjoy reading your posting and projects each week! Cute Card, TFS. I do not make a lot of man cards, wish I did. Men also dont seen to appreciate all the creativity we put into the card...just saying! I'm A retired teacher. I lived at the dollar store. When your a crafter, you don't just see a plate or plastic cup. You ask yourself.. what can I do with this? Happy crafting everyone! Nice card for a guy. I do make some cards for men but not as many as for ladies. It is always a fun challenge to come up with guy cards! I just love the manly stamp set! It is so hard to find stamps specificly for men. I also love your giveaway! How cut these will be on cards. Great manly card. I often find myself making manly birthday cards mostly for my coworkers as most of them are male. Thanks for the chance to win these awesome MCT stamp/die sets. I don't have any of these, and I have a lot of them. I am always on the lookout for masculine cards. Thanks so much. I'd be delighted to win the stamp sets, so hope that I am super lucky! Great card! Yes I make a lot of cards for my husband and I'm always looking for masculine card ideas! I especially like the stamp set with the moustache in them. We will be soon planning my grandson's first party with the theme of "Little Man" They would be just perfect to use for all sorts of stuff for his party. I would love to win the stamp give away. They are all great. Thank you so much for giving us the opportunity to win these stamp sets. Love your man card! The toolbox and tools are great! I'm not as good at the man cards as I am with the pretty and cutsie ones, but with 4 grandsons, 2 son-in-laws, my dad and my husband I really need to do better! Manly cards are so much harder to do. Those sayings on the stamps are wonderful. It's not always that you find stamps with such great sayings. Could use them to make such a variety of cards.